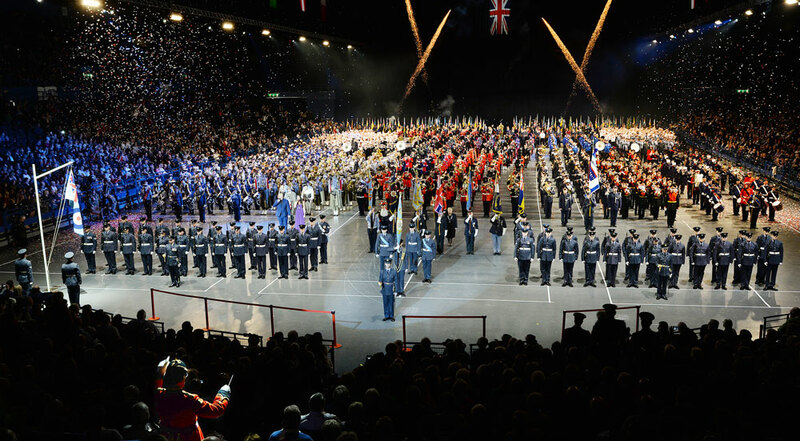 The spectacular Grand Finale sees the culmination of our show as all the performers line up and fill the Arena Birmingham in a spectacle of light and sound. However, this performance is the end of a journey that has taken many months of practice by the bands and other performers, over one year of planning by the organisation team and many thousands of miles of travel by the bands from across the UK and further afield in Europe. It is impossible to add up the many years of musical experience on parade each year but it must run into many tens of thousands of years, all culminating in the performance for you. ‘Tattoo’ is the traditional signal, given originally by drum beat, and latterly by bugle or trumpet call, which warned British soldiers to return to their quarters for the night. The innkeepers turned off the liquor taps and the drums continued to beat for half an hour, during which time the soldiers were allowed to make their way home. The custom developed into a ceremonial performance of military music by massed bands a few hours after sunset. The tradition of including a hymn in the closing stages derives from a custom of the Imperial Army of Czarist Russia, in which their soldiers, conscripted virtually for life from the deeply pious peasant masses, sang a chorale. The custom spread to the Catholic armies of Austria and to the predominantly Lutheran army of Prussia, where the ceremony was developed into an impressive torchlight parade. At the end of the 19th Century, performances by massed regimental bands became popular in the larger garrison towns in Britain, and these, following continental practice, came to include an evening hymn. Some of the old regiments of the British Army, notably the 10th Hussars, 12th Lancers and Royal Scots Fusiliers, maintained the tradition independently by playing a hymn on Sunday evenings between the two calls which marked the beginning and the end of the Tattoo period. They were known as First and Last Post and were sounded at 9.30pm and 10pm. The Hussars, however, sounded Last Post at 9.40pm, the time of the death of Lord Cardigan who had commanded the Regiment for many years, whilst the Life Guards sounded the calls outside the barrack gates to commemorate their original function of recalling the soldiers to their barracks. In Aldershot, Britain’s largest military station, the ceremony was extended to include the wide variety of displays with which the name is now associated, which have no connection, apart from the music of the bands, with the traditional function of the ceremony. Gradually ‘Retreat’ and ‘Tattoo’ were embellished from time to time adding more drummers and musicians who played cheerful tunes. Bands were sometimes added and ‘Tattoo’ became a display of drums and bands by torchlight to entertain the garrisons, leading to the idea of a ‘Tattoo’ as a military pageant. ‘Retreat’ has remained a display by a Corps of Drums with bands added on special occasions. It still has a military use - the Queen’s Regulations lay down that guards are to turn out at ‘Retreat’ for inspection by the Guard Commander. ‘Retreat’ is now usually sounded on a bugle in barracks.